Independent Investigations Group-Atlanta had our big debut this year at Dragon*Con: we had a table, we brought in a guest speaker, mentalist Mark Edward and we distributed lots of brochures and cards inviting people to take our $50,000 Challenge. We also kept an eye on the ParanormalTrack. One day, another member and I attended ParanormalTrack’s Psychic Reading Gallery featuring Ericka Boussarhane, “the Oprah of theParanormal.” We distributed our version of Granite State Skeptics’ psychic bingo cards at the door; however, since most people were already seated, we only handed out a few. Fortunately, one young woman was so delighted with hers that she got more from us and passed them out to other members of the audience. We can haz minion?Mwahahaha! Psychic, Intuitive, Empath, Dreams, Horoscopes, Reiki II Clairvoyant, Success Coach, Cold Cases, Ordained Minister, Notary, Psychic Detective, Criminal Readings, Astrology, Counseling, Missing Persons & Tarot Readings . 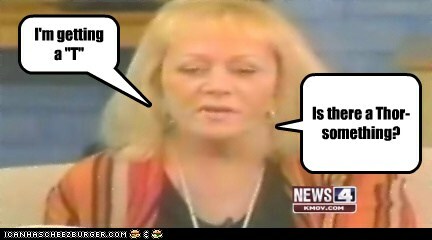 In addition to being the “Oprah of the paranormal,” she has auditioned for Oprah’s OWN cable network. At Dragon*Con, she was heavily promoting Pensacola ParaCon 2011. She is also promoting the Con on her website. Boussarhane comes off as warm, personable and somewhat goofy. She projects an earth-mothery, women’s-feelings-are-magic vibe that I suspect would suit Oprah’s Jenny McCarthy/Suzanne Somers-infected network. She began by talking about herself, her background and her point of view. She believes everyone is “intuitive.” Her mother was very psychic, “like a lot ofwomen.” She did mention that she has worked with cold cases but offered no details. In her public readings, she tries to cover everyone in the room, so she began her readings in the front row. Although the room was fairly small, she did not get to Elizabeth and me. Her method also meant that there was no time for questions at the end. After her introduction, she made all sing “Twinkle, twinkle little star.” This, she said, would change the feel of the room and create “positive energy.” It would cause “good people” to come across, not those who want to talk about underwear (it seems that Ms. Boussarhane is frequently assailed by spirits with Tourette’s Syndrome or at least very poor impulse control). She explained that she begins a reading with a silent prayer and closes her eyes so she won’t be influenced by visual clues. She was, she says, a psychology major and knows about “skeptic stuff.” She did’t mention cold reading, but it was clear that that was what she was talking about. It also seemed clear that she was, in fact, using cold reading techniques. While she does close her eyes, she does not keep them closed throughout the entire reading. If there are visual cues to be seen, then she sees them. She explained that not everything she says will be a hit, and, indeed, when one of her statements fails to hit the mark, she often accepts it and moves on, rather than aggressively suggesting that the audience member must be wrong (à la John Edward). She did, however, mention that the information she is getting for one audience member might actually apply to another, or to a relative, or to a friend, or to someone the audience member passed on the street last week (okay, I added the last one). I should mention that, from where we were sitting, it was often difficult to tell whether Ms. Boussarhane’s insights were hits or misses: the audience wasn’t miked, and we could only see the backs of the heads of most of the people who received readings. It was also difficult to tell how much information people were providing. That said, Ms. Boussarhane came up with no extraordinary hits. For one woman, she sees an aunt who is “poking her girls [breasts] out.” This means that she has “passed,” apparently. This is a miss. “Well, that’s okay,” says Ms. Boussarhane; she won’t try to make it make sense. For a woman named Jennifer, she sees a large-breasted, blond woman who is dead. The woman wants to hug Jennifer. Her death was sudden, and she shows a puppy (breasts and animals, especially dogs, are a frequent theme). Ms. Boussarhane gets something about “cuttin’ hair.” The woman is “showing me a bathing suit top, kinda hippie-ish.” Jennifer is going to have a dual major and study away from home. At least some of this seems to make sense to Jennifer. At the end of the reading for Jennifer, the dead blond tells her not “‘to sweat the small things.’ She’s talking about your chest.” Ms. Boussarhane apparently does not realize how funny (and perhaps insulting) this is until the crowd laughs. For a woman named Clair, she sees a woman with a “tramp stamp.” Seems to be Hello Kitty or something with kitty ears. Not sure whether this was a hit. I don’t think so. “Did you have a relative you only visited one time?” No. “Is there a Bruce?” Yes. She sees someone giving a man named Hugh a wedgie—a chest-thumping colleague. This is a miss. She asks if he wants to sell a plot of land. He does. She suggests that he get his cholesterol checked because high cholesterol and neck blockages run in his family (this is worded oddly—something like, “cholesterol runs high in the neck in your family”). Although a propensity toward high cholesterol somewhere in the family seems a fairly safe suggestion, it appears to be a miss. She tells someone, “The check is in the mail. Literally, the check’s in the mail. Not literally the check’s in the mail.” I’m not sure if this made sense to its intended target, but it didn’t to me. “Someone put a big Shakespearean head on you. Or a hat. Or Peter Pan.” At first, I imagined someone with a bust of Shakespeare on top of or over the individual’s own head, but I think she meant an Elizabethan hat. Regardless, it isn’t a hit. “Who killed a lizard in the house?” No one. Oddly, the lizard is the one thing Ms. Boussarhane can’t let go of. She keeps trying to find some connection to a lizard. In vain. She gives one woman information that relates to the woman’s mother. Or, to be more accurate, the woman relates it to her mother. Ms. Boussarhane asks if the woman comes from from New York. The woman says no, but her mother did. She says, “I’m sensing that your mother’s not here.” Now, it seems to me that she’s suggesting that the mother has died, but “not here” could mean not in Atlanta or not at Dragon*Con, and that is how the woman takes it. This woman is sitting in the row ahead of me, so I can see and hear the exchange better than I could many of the earlier readings. The woman is clearly, if unwittingly, leading Ms. Boussarhane. The woman is also clearly upset about some things going on in her family, and the reading is starting to get uncomfortable when time runs out. While Ms. Boussarhane’s wedgie-giving, big-boobed spirits are somewhat entertaining, this woman brings home to me why psychics are such horrible leaches. Although there were no tears or raw emotions over suicides or dead babies, this woman was upset about the way her mother is being treated (by whom, I’m not sure). The psychic’s words seemed to make sense to her, even if she was providing most of the information. The reading was brief, but the woman seemed to become very involved in it and seemed to hope she could get something useful out of the reading. There may be help for her, but it is not going to come in a one-minute reading at Wookie-infested convention.